Happy 9th birthday Vincent Edward! But Kelli, Sal and Nick were picked for a Pirate's game! While our little lady stayed by the watering tree. We tried out the Central Florida Zoo before going to Disney to continue Vinny's birthday weekend. The best part of the zoo was the water area. We enjoyed a day at the beach with Crystal's Crew, Mommy's Joy and Daily Dose of Dunlaps. Then we headed for Disney to start Vinny's birthday early! The zoo is having a summer nights special from 5-9. The only thing about going to the zoo at night is most of the animals are sleeping. We did get to see a bearded dragon and crocodile! Nicholas as Harry Potter and his buddy Eli with the school librarian was on today's front page! Since Arts and Crafts Day went well, today we tried Baking Day! 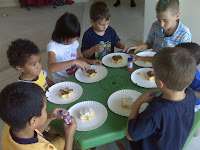 Each child got a star shaped cake to decorate and eat! Harry Potter Day at school! We had a cast of characters! Everyone was photographed by the newspaper, wonder who will be published? We had to say goodbye to Gina and Bill's family until our next visit. After parting our family enjoyed Test Track for the first time....until next time! Alyssa and Gabriella just thought Nicholas was too cute... Kelli and Adrianna instantly became great friends!